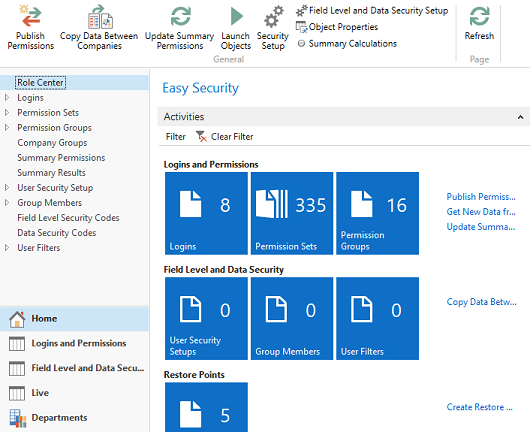 Easy Security for Microsoft Dynamics NAV (Navision) makes it very easy to set up roles and permissions for multiple users across multiple companies – saving you time, money and resources when setting up security for NAV. Easy Security contains a "Recorder" for permissions, that captures all permissions simply by using the application. By adding a Source Code Analyzer on top of the recordings is the Roles created correct the first time, avoiding costly trial and error approach to creating a new role or updating an existing one. In the standard NAV application is it a very time-consuming and challenging task to assign the right roles to the right users due to the many different roles available. NAV Easy Security simplifies this process by allowing you to create groups of roles and companies and assign these to users. A user can be assigned the same permissions as another user – meaning you only need to maintain one user. NAV Easy Security also makes Form-Level Security (and other object-type level security) very simple. You only have to select the objects that you want to limit access to, NAV Easy Security automatically maintains permissions for the remainder of the objects. Even multiple add-ons and customizations in the database are easy to manage with NAV Easy Security, Every change can be recorded to create the necessary roles, and you can easily add these recordings to existing roles or build new roles. The Easy Security application is available for the RoleTailored Client and the Classic Client. Maintaining permissions for logins, recording and building roles can all be done from the RoleTailored interface. A new Role Center is offered for the task of maintaining security, making security tasks available from one easy place. Use "Permissions as User ID"
A training video of installation and setup of Easy Security. Comparison of Easy Security editions and features. "The time to set up a role manually could take up to 2 hours, but with NAV Easy Security, it takes 5 minutes, and 90-95% of the tasks were accurate after only one recording." "Thank you for creating this product. As you know, everyone always has been looking for a better way to implement permissions in NAV. I have recommended this as a “need to have” for basically all our bigger customers"
Modules and pricing for NAV Easy Security. The Easy Security must be purchased through your NAV partner as other modules for Microsoft Dynamics NAV. The Easy Security product is available for partner to use. 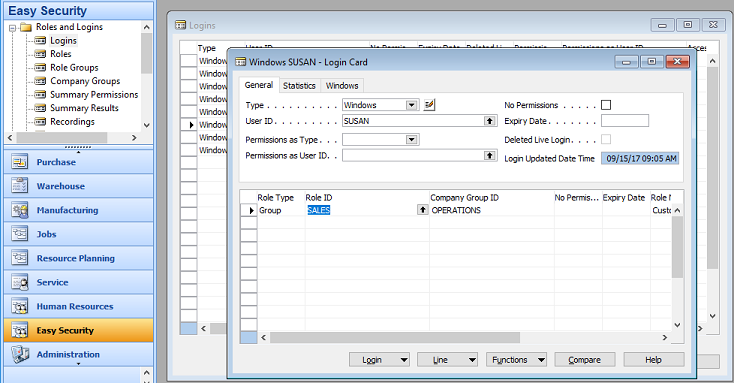 Purchase of a Partner License is required for using Easy Security for creating Roles for your ISV or custom solution. Please contact EasySecurity@mergetool.com for a demo version, to get the current version of the source code or a pricelist. Copyright © 2015 Mergetool.com. All Rights Reserved.